Nebraska used a change to zone defense in the second half and big days from newcomers Bria Stallworth and Kate Cain to work its way to a 62-53 women’s basketball win over SIU Edwardsville on Saturday at Pinnacle Bank Arena. 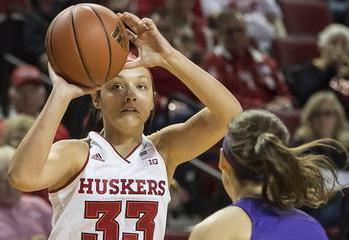 Stallworth, a 5-6 sophomore guard from Chicago, Ill., scored a game-high 21 points off the bench in her Husker debut. The transfer from UMass hit 7-of-14 shots from the field including 3-of-6 three-pointers to spark the Nebraska offense against an experienced SIUE team that returned all five starters. Stallworth added six assists, three rebounds and a steal in 28 big minutes off the bench. Cain, a 6-5 freshman center from Middletown, N.Y., added 18 points and a team-high nine rebounds inside for the Big Red off the bench. Cain hit 9-of-15 shots from the floor and was the recipient of four of Stallworth’s assists. Cain added four blocked shots, a steal and an assist of her own to Stallworth in the victory. With Cain and Stallworth carrying the load, Nebraska’s bench outscored the SIUE bench 39-2 in the victory. Nebraska improved to 1-0 while moving to 42-2 all-time in season-opening games. SIUE, which was the preseason pick to finish second in the Ohio Valley Conference, slipped to 0-1. Nebraska’s top returning scorer Hannah Whitish (Barneveld, Wis.) contributed eight points, seven rebounds and five assists before fouling out midway through the fourth quarter, while freshman guard Taylor Kissinger (Minden, Neb.) pitched in five points, three rebounds, two assists and a block despite battling foul trouble throughout the game. The Huskers opened with a stingy man-to-man defense that allowed them to work their way to a 12-11 lead at the end of the first quarter against a scrappy Cougar bunch. In an even lower scoring second quarter, the Huskers again managed a one-point edge to take a 23-21 lead to the halftime locker room. Stallworth and Cain combined for 17 of Nebraska’s 23 points in the first half, including 11 from Stallworth. Early in the second half, SIUE surged ahead on the strength of a 9-0 run to take its biggest lead at 38-30 on a Nakiah Bell three-pointer with 5:07 left in the third quarter. Bell, an Iowa State transfer, finished with 15 points on 5-of-12 three-point shooting. Nebraska Coach Amy Williams called timeout to stop the Cougar run and make adjustment, switching to a 1-3-1 zone defense that stifled SIUE for the rest of the quarter. Cain scored quickly after the timeout and Nebraska’s defense stopped the Cougar momentum. In fact, Cain scored six points in less than three minutes with her third bucket in that surge tying the score at 38. Stallworth then hit a shot with 1:38 left in the third to give Nebraska the lead for good at 40-38, before adding a three-point play with 1:07 left to cap NU’s 13-0 run to end the quarter and send Nebraska to the final period with a 43-38 lead. Nebraska’s run reached 15-0 with a Kissinger basket to open the fourth and give the Huskers a 45-38 edge with 9:09 left. Donshell Beck, SIUE’s top returning scorer who reached 1,000 career points with her second free throw early in the third quarter, finally stopped a 6:32 scoreless stretch. Beck finished with 14 points before fouling out in the fourth quarter. Lauren White, who led SIUE with 18 points and five assists, then hit back-to-back shots to trim Nebraska’s lead to 45-44. But six straight points from Maddie Simon, Hannah Whitish and Cain pushed NU’s lead back to seven. Cain and Stallworth combined for 11 of Nebraska’s final 13 points in the last five minutes to seal the victory, as Nebraska took its biggest lead of the game at 61-50 before settling for the nine point win. Simon finished with four points, eight rebounds, a steal and a block, while Jasmine Cincore pitched in four points, two rebounds, an assist, two steals and a block. Darrien Washington also managed two points, three rebounds and an assist for the Huskers. Nebraska hit 41.7 percent (25-60) of its shots in the game, but just 4-of-17 three-pointers (.235). NU also connected on 8-of-14 free throws. The Huskers held SIUE to just 29.7 percent (19-64) shooting, including 6-of-23 threes (.261). The Cougars connected on 9-of-15 free throws. Both teams grabbed 45 rebounds, and SIUE won the turnover battle, 15-14. Jay’Nee Alston (3 points), Lyric Boone (2) and Sydney Bauman (1) rounded out the scoring for SIUE. The Huskers return to home action on Tuesday when they take on UMKC. Tip off with the Roos is set for 7 p.m. with tickets on sale now at Huskers.com. It will be UMKC’s first visit to Lincoln since 1989.